Arthur's class is writing essays for the national contest, "How can I help make America great?" 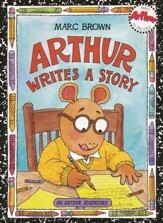 Arthur decides to write about the time he and D.W. helped their neighbor clean her yard. 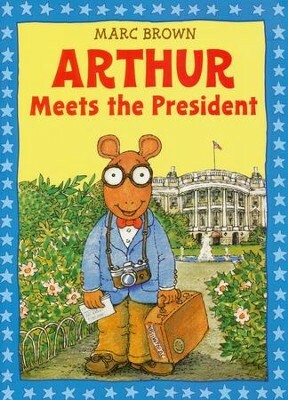 When Arthur wins the contest, he and his class get to go to Washington, D.C. to meet the President and Arthur will recite his speech in front of the country. Arthur is so nervous that he won't be able to remember his speech so he makes notecards . . . but when they blow away in the wind, what will Arthur do? Arthur is off to Washington D.C. to meet the President of the United States and recite his winning essay in front of everyone. But a gust of wind blows Arthur's trusty note cards away Who can help him? Marc Brown is the creator of the bestselling Arthur Adventure book series and creative producer of the number-one children's PBS television series, Arthur. He has also created a second book series featuring D.W., Arthur's little sister, as well as numerous other books for children. 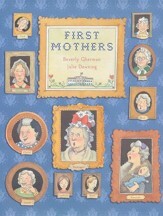 Marc Brown lives with his family in Tisbury, Martha's Vineyard. I'm the author/artist and I want to review Arthur Meets The President.